With this generation of Synchroforce CXP & CXA belts there has never been a stronger and tougher HTD heavy-duty timing belt. 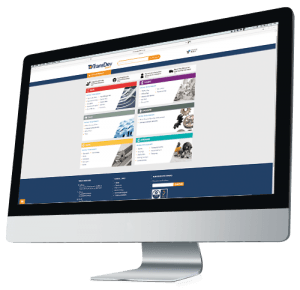 The CXP range has a specifically developed tension member and exceptional material bonding. 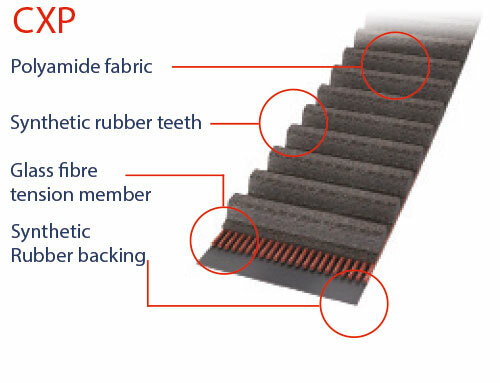 The teeth and the belt top are made from a synthetic Rubber mix with high tear resistance and enhanced shear resistance, to ensure reliable sustained power transmission at belt speeds up to 50m/s. The CXP range is used where high power must be transmitted above 1000RPM. These tensile members have a high flexural fatigue strength along with a highly reliable power transmission capability up to 50m/s. 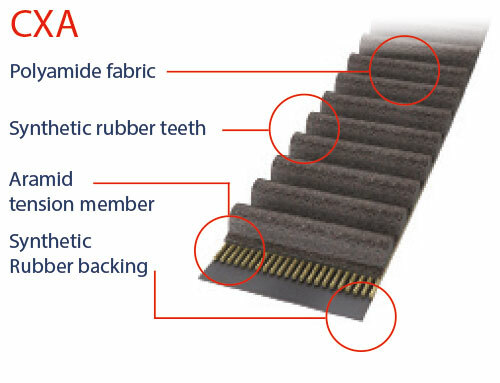 Durable teeth protection is provided with an abrasion resistant special fabric, with a low coefficient of friction. The CXA range combines exceptionally high tensile strength with the stable synthetic Rubber compound to transmit extremely high torque levels at belt speeds of up 20m/s. The CXA range is used where high torque must be transmitted under 1000RPM. The tensile members strongly resist tension loads and even cope with extremely high starting torques at speeds of up to 20m/s. The teeth and the belt top are made from a synthetic rubber mix with high tear resistance and enhanced shear resistance, to ensure reliable, sustained power transmission.